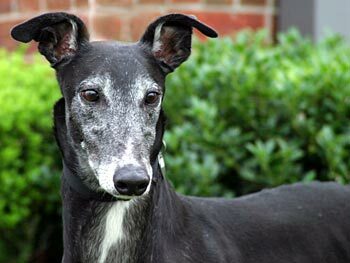 Duke, aka Aaron's Memory, is a lovable, 4-year-old black male. 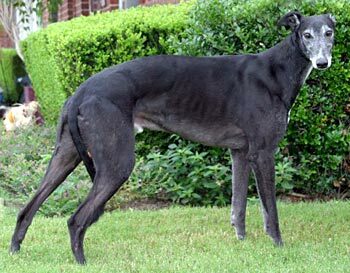 He, along with his brother Teddy, was born on June 10, 2004, to sire Evening Memory and dam Marks Astro. Duke and Teddy come from a strong racing background, but neither boy showed an interest in competition. Early on, Duke figured out that he preferred chin scratches to races, and is quite adept at leaning against your legs to soak up every bit of love you are willing to give him. He is a handsome boy, sporting a white tuxedo and a salt-n-pepper face. Duke was adopted and was in a home for almost two years, but it was not to be his forever home and he was returned through no fault of his own. 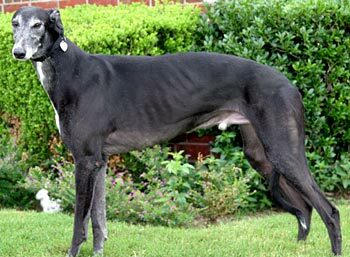 Duke gets along well with other Greyhounds and is cat trainable, but it is not known at this time how he does with small dogs.